Multiple new iPad models are being tested in Cupertino and the nearby Bay Area, potentially confirming rumors suggesting several refreshed iPads are launching in the near future. New iPad model identifiers have been spotted in device data collected by mobile marketing company Fiksu and were shared by TechCrunch this morning. Four identifiers have been popping up in data logs, but that doesn't necessarily correspond to four new devices as WiFi and WiFi + Cellular iPads historically have different model numbers. Fiksu believes the numbers correspond to between two and four new iPads. Below are the iPad identifiers that have been found along with their corresponding count, as provided by Fiksu. Only a small number of visits have been seen, which Fiksu says is "about the same number we see being tested about a month before release." At the very least, the presence of these identifiers suggests there are a minimum of two new iPad models in the works, in line with rumors suggesting Apple is working on both a revamped 10.5-inch iPad Pro that will effectively replace the 9.7-inch iPad Pro and a new 12.9-inch model. The 10.5-inch iPad Pro is said to feature a nearly bezel-free edge-to-edge display that allows Apple to fit a larger screen in the same 9.7-inch form factor, and it is said to include an A10X processor and Touch ID built directly into the display. Rumors sourced from reliable KGI Securities analyst Ming-Chi Kuo have suggested there are supposed to be three new models on the horizon, including a 12.9-inch tablet, a lower-cost 9.7-inch tablet (priced as low as $299), and the flagship 10.5-inch tablet, while Japanese site Mac Otakara has claimed Apple could be working on four iPads, the three mentioned by Kuo along with a 7.9-inch iPad mini Pro model. Though Fiksu is seeing only four identifiers, it's possible additional iPads are in development but haven't been found in device logs as of yet. On the other hand, it potentially indicates we're going to get a new 10.5-inch model and a new 12.9-inch model, with no new iPad mini or refreshed lower-end 9.7-inch model. This scenario doesn't fit Mac Otakara's prediction, but should Apple lower the price of the existing 9.7-inch iPad Pro, it does fit in with what Kuo has predicted. Apple's new iPads could debut as soon as later this month, according to supply chain analysts who shared the information with MacRumors this morning. Apple may be planning an event or a release for late March, perhaps even as early as next week. 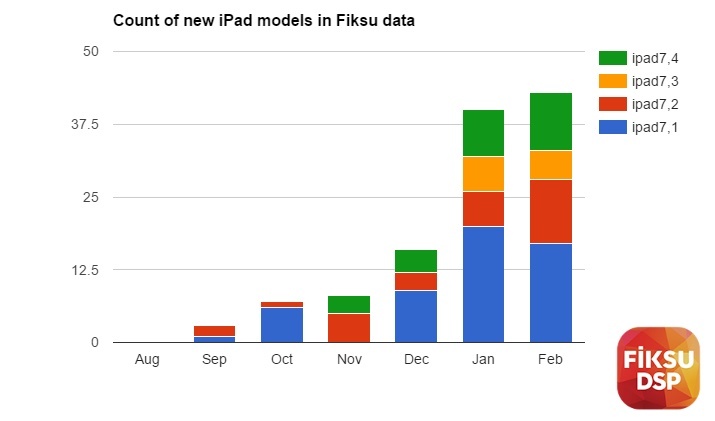 Update: Fiksu has released an additional chart that displays the count of new iPad models in its data starting in September. The number of iPad Pro models have been steadily ramping up, leading Fiksu to predict an "imminent" release date within a month. Fix iOS for iPad then we can talk. Personally I think it should be ban worthy to whine about Macs in an iOS device-related article. Not sure why this nonsense is tolerated on this site. Back on the topic, I just hope that Apple still release a new iPad mini...my iPad 3 is in dire need to be replaced. Adding my voice to those hoping for new Mac models! 4 billion a year in R&D and they come up with the same crap. What are they doing with all that money. However, please understand the frustration from the Mac camp. We've been talking about new iPads continuously year after year with little hope in the Mac desktop especially camp for 2+ years now. Unless Apple only slightly ups the specs, Apple would surprise me by not having some kind of event. The iDevices are their pride and joy, their flagship products, and Apple loves making a spectacle. I'd also like an upgraded/redesigned Mac lineup. Besides the MacBook Pro with TouchBar, everything else hasn't been touched in years. I know a lot depends on Intel and its CPUs, but upgrade to NVMe SSDs, ditch spinning hard drives, upgrade everything to USB-C/TB3, get better graphics.